How is climate change affecting coral reefs? One of the most important threats facing coral reefs on a global scale is a big one: climate change. Scientists agree that climate change is real, and this spells real trouble for the world’s coral reefs. 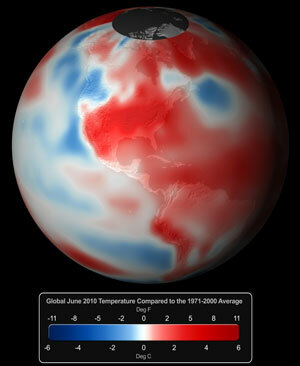 The global average combined land and ocean surface temperature for the month of June 2010 was the warmest on record. Global ocean temperature has risen by 1.3°F since the late 19th century and is continuing to climb. Rising (or even falling) water temperatures can stress coral polyps, causing them to lose algae (or zooxanthellae) that live in the polpys’ tissues. This results in “coral bleaching,” so called because the algae give coral their color and when the algae “jump ship,” the coral turns completely white. The algae also give coral polyps the food they need to survive. While a bleached coral is not dead, and corals can survive bleaching events, they are under greater stress, are less resistant to other threats such as disease, and are thus subject to mortality. Increased carbon dioxide in the atmosphere is one of the recognized causes of our changing climate and it is also problematic for coral reefs. The ocean absorbs approximately one-third of the atmosphere’s excess carbon dioxide, resulting in a more acidic ocean. In order for a coral reef to grow, it must produce limestone (or calcium carbonate) at a rate that is faster than the reef is being eroded. Ocean acidification slows the rate at which coral reefs generate calcium carbonate, thus slowing the growth of coral skeletons. Climate change can cause sea level rise; changes in the frequency, intensity, and distribution of tropical storms; and altered ocean circulation. All of these impacts can have negative consequences for the health and diversity of reefs around the world, including in the Florida Keys.